Using drag and drop, you can move files from one project to another. The revision history, logs and other related data is moved along. To do this, first expand the destination project so the destination folder is shown (TOM does not automatically expand while dragging). Then select the file to be moved on the left side of the Repository Explorer (TOM does not allow drag and drop from the right pane view) and drag it to the destination folder. An issue with TOM is, it does not automatically scroll the left pane view when you drag the file. So when the destination project is out of view, it seems impossible to do drag and drop. Go to the destination project in the left pane view and select it. Then select Open view from the context menu. 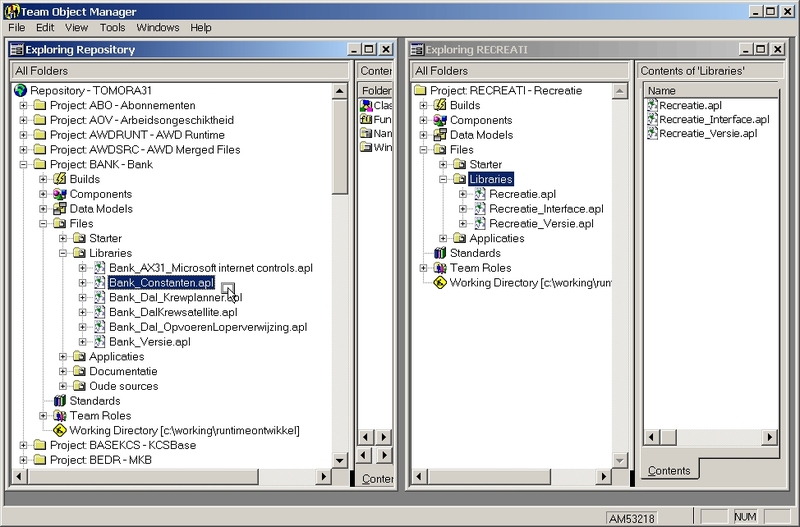 The project will be shown in a separate Repository Explorer window. Now, resize the main window and the project view window such that you can drag and drop the file when both source and destination folders are visible on screen. You are able to drag a file from one view to another, always use source and destination left pane views for that. This page was last modified on 16 July 2013, at 09:47.